Fall 2014 release for RC line. Fall 2014 debut: 2015 Lexus RC F.
Toyota introduced two sport cars at the 2014 North American International Auto Show in Detroit this week: one was the Toyota FT-1 concept, the other was the production-bound Lexus RC F. Suffice to say the concept received more buzz than the model that will be produced, perhaps for a very good reason: the FT-1 may very well become the future Toyota Supra. 1. For the stirring introduction by Detroit son, Jeff Bracken, now Lexus Group Vice President and General Manager. Bracken told his Cobo Hall audience how the Shelby Cobra hooked him and defined his destiny. He graciously lauded the Cobra, using that tribute as a segue for introducing the RC F.
2. As much as the speech set the table for Lexus newest sports car it was the RC F itself that lit up the audience while also pointing to even better things to come. Sure, Lexus has had its share of performance models in the past including the IS F. But, Lexus has served up more hybrids than top performers, besides the brands expansive fleet of luxury vehicles. The Lexus RC F is the third sporty/performance model introduced in as many months, following the introduction of the Lexus RC Coupe at the Tokyo Motor Show last month. That model features two very different powertrains: a 2.5-liter hybrid and a 3.5-liter V-6. 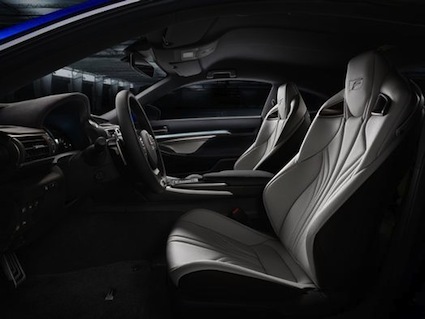 The RC F will be powered by a normally aspirated 5.0-liter V-8 engine, one making at least 450 horsepower and 383 foot-pounds of torque. Said Bracken about the new model, This is the fastest and most powerful V8 yet for Lexus. And it is no ordinary V8 engine either: it utilizes both the Atkinson and Otto cycle in a bid to enhance fuel economy and increase performance. At lower speeds the Atkinson cycle is at work; when performance is needed the Otto cycle takes over. The power management tool here is an 8-speed transmission. There are a number of special features at work in the Lexus RC F that should interest fans. For one, it features an active wing, much like the one found with the LFA. The wing serves to increase downforce and improve grip over the rear 19-inch tires. Another feature is the functional vent hood, designed to decrease aerodynamic lift. And, there is also a torque vectoring differential, designed to manage traction in, through and out of corners. Lexus gave us select highlights about the the Fs interior telling us that the instrument panel will be punctuated by a 7-inch navigation screen. It will also feature a touchpad interface, working much like your iPad or similar device. Lexus says that climate control, navigation, and media selections can be operated by a swipe of a finger. You’ll have to wait a bit for the Lexus RC F and the like RC 350, with both models going on sale this fall. Lexus expects to sell 1,400 RC vehicles a month once it hits its stride. 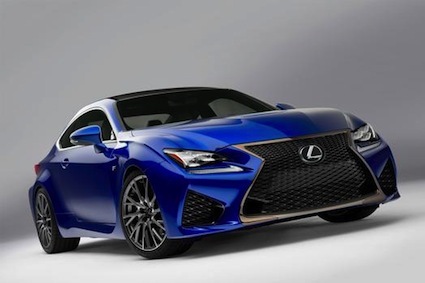 And, if you like the RC F you can be assured that Lexus wont be stopping there. 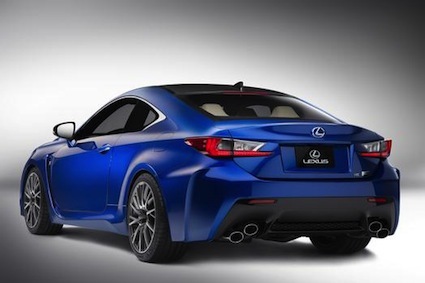 Bracken notes that the “…RC F is only the next addition of more Lexus performance to come.” And Lexus fans rejoiced! Audi Allroad Shooting Brake Concept Debuts>Toyota FT-1 Concept to a Supra Reality? Toyota FT1 Concept to a Supra Reality? Photos courtesy of Toyota Motor Sales, USA, Inc.